We are all indebted to Carl Watner for uncovering an unknown work by the great Lysander Spooner, one that managed to escape the editor of Spooner's Collected Works. Both the title and the substance of "Vices are not Crimes" highlight the unique role that morality and moral principle had for Spooner among the anarchists and libertarians of his day. For Spooner was the last of the great natural-rights theorists among anarchists, classical liberals, or moral theorists generally; the doughty old heir of the natural law–natural rights tradition of the 17th and 18th centuries was fighting a rearguard battle against the collapse of the idea of a scientific or rational morality, or of the science of justice or of individual right. Not only had natural law and natural rights given way throughout society to the arbitrary rule of utilitarian calculation or nihilistic whim, but the same degenerative process had occurred among libertarians and anarchists as well. Spooner knew that the foundation for individual rights and liberty was tinsel if all values and ethics were arbitrary and subjective. 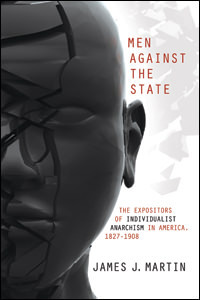 Yet, even in his own anarchist movement Spooner was the last of the Old Guard believers in natural rights; his successors in the individualist-anarchist movement, led by Benjamin R. Tucker, all proclaimed arbitrary whim and might-makes-right as the foundation of libertarian moral theory. And yet, Spooner knew that this was no foundation at all; for the State is far mightier than any individual, and if the individual cannot use a theory of justice as his armor against State oppression, then he has no solid base from which to roll back and defeat it. With his emphasis on cognitive moral principles and natural rights, Spooner must have looked hopelessly old-fashioned to Tucker and the young anarchists of the 1870s and 1880s. And yet now, a century later, it is the latter's once fashionable nihilism and tough amoralism that strike us as being empty and destructive of the very liberty they all tried hard to bring about. We are now beginning to recapture the once-great tradition of objectively grounded rights of the individual. In philosophy, in economics, in social analysis, we are beginning to see that the tossing aside of moral rights was not the brave new world it once seemed — but rather a long and disastrous detour in political philosophy, which is now fortunately drawing to a close. Opponents of the idea of an objective morality commonly charge that moral theory functions as a tyranny over the individual. This, of course, happens with many theories of morality, but it cannot happen when the moral theory makes a sharp and clear distinction between the "immoral" and the "illegal," or, in Spooner's words, between "vices" and "crimes." The immoral or the "vicious" may consist of a myriad of human actions, from matters of vital importance down to being nasty to one's neighbor or to willful failure to take one's vitamins. But none of them should be confused with an action that should be "illegal," that is, an action to be prohibited by the violence of law. The latter, in Spooner's libertarian view, should be confined strictly to the initiation of violence against the rights of person and property. Other moral theories attempt to apply the law — the engine of socially legitimated violence — to compelling obedience to various norms of behavior; in contrast, libertarian moral theory asserts the immorality and injustice of interfering with any man's (or rather, any noncriminal man's) right to run his own life and property without interference. For the natural-rights libertarian, then, his cognitive theory of justice is a great bulwark against the State's eternal invasion of rights — in contrast to other moral theories that attempt to employ the State to combat immorality. "If the individual cannot use a theory of justice as his armor against State oppression, then he has no solid base from which to roll back and defeat it." Briefly, the pietist tends to hold that to be truly religious, a person must experience an emotional conversion; the convert, in what has been called "the baptism of the Holy Spirit," has a direct relationship to God or to Jesus. The liturgical, on the other hand, is interested in either doctrinal belief or the following of prescribed church ritual as the key to salvation. Now, it might seem as if the pietistic emphasis on the individual might lead to a political individualism, to the belief that the State may not interfere in each individual's moral choices and actions. In 17th-century pietism, it often meant just that. But by the 19th century, unfortunately, such was not the case. Most pietists took the following view: since we can't gauge an individual's morality by his following rituals or even by his professed adherence to creed, we must watch his actions and see if he is really moral. From there the pietists concluded that it was everyone's moral duty to his own salvation to see to it that his fellow men as well as himself are kept out of temptation's path. That is, it was supposed to be the State's business to enforce compulsory morality, to create the proper moral climate for maximizing salvation. In short, instead of an individualist, the pietist now tended to become a pest, a busybody, a moral watchdog for his fellowman, and a compulsory moralist using the State to outlaw "vice" as well as crime. The liturgicals, on the other hand, took the view that morality and salvation were to be achieved by following the creed and the rituals of their church. The experts on those church beliefs and practices were, of course, not the State but the priests or bishops of the church (or, in the case of the few orthodox Calvinists, the ministers.) The liturgicals, secure in their church teachings and practices, simply wanted to be left alone to follow the counsel of their priests; they were not interested in pestering or forcing their fellow human beings into being saved. And they believed profoundly that morality was not the business of the State, but only of their own church mentors. From the 1850s to the 1890s the Republican party was almost exclusively the pietist party, known commonly as the "party of great moral ideas"; the Democratic party, on the other hand, was almost exclusively the liturgical party, and was known widely as the "party of personal liberty." "The tossing aside of moral rights was a long and disastrous detour in political philosophy…"
Specifically, after the Civil War there were three interconnected local struggles that kept reappearing throughout America; in each case, the Republicans and Democrats played out their contrasting roles. These were: the attempt by pietist groups (almost always Republican) to enforce prohibition; the attempt by the same groups to enforce Sunday blue laws; and the attempt by the selfsame pietists to enforce compulsory attendance in the public schools, in order to use these schools to "Christianize" the Catholics. What of the political and economic struggles that historians have, until recently, focused on almost exclusively — sound money vs. fiat money or silver inflation; free trade vs. a protective tariff; free markets vs. government regulation; small vs. large government spending? It is true that these were fought out repeatedly, but these were on the national level, and generally remote from the concerns of the average person. I have long wondered how it was that the 19th century saw the mass of the public get highly excited about such recondite matters as the tariff, bank credits, or the currency. How could that happen when it is almost impossible to interest the mass of the public in these matters today? Kleppner and the others have provided the missing link, the middle term between these abstract economic issues and the gut social issues close to the hearts and lives of the public. Specifically, the Democrats, who (at least until 1896) favored the free-market libertarian position on all these economic issues, linked them (and properly so) in the minds of their liturgical supporters, with their opposition to prohibition, blue laws, etc. The Democrats pointed out that all these statist economic measures — including inflation — were "paternalistic" in the same way as the hated pietistic invasions of their personal liberty. In that way, the Democrat leaders were able to "raise the consciousness" of their followers from their local and personal concerns to wider and more abstract economic issues, and to take the libertarian position on all of them. The pietist Republicans did similarly for their mass base, pointing out that big government should regulate and control economic matters as it should control morality. In this stance, the Republicans followed in the footsteps of their predecessors, the Whigs, who for example were generally the fathers of the public school system in their local areas. Generally, the "mind your own business" liturgicals almost instinctively took the libertarian position on every question. But there was of course one area — before the Civil War — where pestering and hectoring were needed to right a monstrous injustice: slavery. Here the typical pietistic concern with universal moral principles and seeing them put into action brought us the abolitionist and antislavery movements. Slavery was the great flaw in the American system in more senses than one: for it was also the flaw in the instinctive liturgical resentment against great moral crusades. To return now to Lysander Spooner — Spooner, born in the New England pietist tradition, began his distinguished ideological career as an all-out abolitionist. 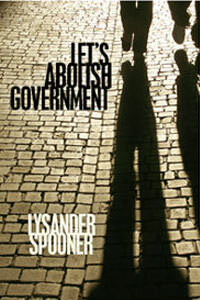 Despite differences over interpretation of the US Constitution, Spooner was basically in the anarchistic, "no-government" Garrisonian wing of the abolitionist movement — the wing that sought the abolition of slavery not through the use of the central government (which was in any case dominated by the South), but by a combination of moral fervor and slave rebellion. Far from being fervent supporters of the Union, the Garrisonians held that the northern states should secede from a proslaveholding United States of America. So far, Spooner and the Garrisonians took the proper libertarian approach toward slavery. But the tragic betrayal came when the Union went to war with the Southern states over the issue of their declared independence. Garrison and his former "no-government" movement forgot their anarchistic principles in their enthusiasm for militarism, mass murder, and centralized statism on behalf of what they correctly figured would be a war against slavery. Only Lysander Spooner and a very few others stood foursquare against this betrayal; only Spooner realized that it would be compounding crime and error to try to use government to right the wrongs committed by another government. And so, among his pietistic and moralizing antislavery colleagues, only Spooner was able to see with shining clarity, despite all temptations, the stark difference between vice and crime. He saw that it was correct to denounce the crimes of governments, but that it was only compounding those crimes to maximize government power as an attempted remedy. Spooner never followed other pietists in endorsing crime or in trying to outlaw vice. Spooner's anarchism was, like his abolitionism, another valuable part of his pietist legacy. For, here again, his pietistic concern for universal principles — in this case, as in the case of slavery, for the complete triumph of justice and the elimination of injustice — brought him to a consistent and courageous application of libertarian principles where it was not socially convenient (to put it mildly) to have the question raised. Talk about a suppressed intellectual tradition! While the liturgicals proved to be far more libertarian than the pietists during the second half of the 19th century, a pietistic spirit is always important in libertarianism to emphasize a tireless determination to eradicate crime and injustice. Surely it is no accident that Spooner's greatest and most fervent anarchistic tracts were directed in dialogue against the Democrats Cleveland and Bayard; he did not bother with the openly statist Republicans. A pietistic leaven in the quasi-libertarian liturgical lump? But it takes firmness in libertarian principle to make sure to confine one's pietistic moral crusade to crime (e.g., slavery, statism), and not have it spill over to what anyone might designate as "vice." Fortunately, we have the immortal Lysander Spooner, in his life and in his works, to guide us along the correct path. One answer is that if the fact that the use of liquors tends to poverty and pauperism be a sufficient reason for prohibiting the sale of them, it is equally a sufficient reason for prohibiting the use of them; for it is the use, and not the sale, that tends to poverty. The seller is, at most, merely an accomplice of the drinker. And it is a rule of law, as well as of reason, that if the principal in any act is not punishable, the accomplice cannot be. A second answer to the argument is, that if government has the right, and is bound, to prohibit any one act — that is not criminal — merely because it is supposed to tend to poverty, then, by the same rule, it has the right, and is bound, to prohibit any and every other act — though not criminal — which, in the opinion of the government, tends to poverty. A third answer to the same argument is that if a man does bring himself to poverty, and even to beggary — either by his virtues or his vices — the government is under no obligation whatever to take care of him, unless it pleases to do so. It may let him perish in the street or depend upon private charity if it so pleases. It can carry out its own free will and discretion in the matter; for it is above all legal responsibility in such a case. Still a fourth answer to the argument is that the great and only incentive which each individual man has to labor, and to create wealth, is that he may dispose of it according to his own pleasure or discretion, and for the promotion of his own happiness, and the happiness of those whom he loves. A fifth answer to the argument is that if it be the duty of government to watch over the expenditures of any one person — who is compos mentis and not criminal — to see what ones tend to poverty, and what do not, and to prohibit and punish the former, then, by the same rule, it is bound to watch over the expenditures of all other persons, and prohibit and punish all that, in its judgment, tend to poverty. If it be said that a man may, at least, be rightfully compelled to support his family, and, consequently, to abstain from all expenditures that, in the opinion of the government, tend to disable him to perform that duty, various answers might be given. But this one is sufficient, viz. : that no man, unless a fool or a slave, would acknowledge any family to be his, if that acknowledgment were to be made an excuse, by the government, for depriving him, either of his personal liberty, or the control of his property. You can subscribe to future articles by [AuthorName2] via this [RSSfeed2]. [i] Paul Kleppner, The Cross of Culture: A Social Analysis of Midwestern Politics, 1850–1900 (New York: Free Press, 1970). Also see Richard Jensen, The Winning of the Midwest: Social and Political Conflicts, 1888–1896 (Chicago: University of Chicago Press, 1971). To give an insane man a knife or other weapon or thing by which he is likely to injure himself, is a crime. The statute book of Massachusetts makes ten years the age at which a female child is supposed to have discretion enough to part with virtue. But the same statute book holds that no person, man or woman, of any age, or any degree of wisdom or experience, has discretion to be trusted to buy and drink a glass of spirits on his or her own judgment! What an illustration of the legislative wisdom of Massachusetts! Cato committed suicide to avoid falling into the hands of Caesar. Who ever suspected that he was insane? Brutus did the same. Colt committed suicide only an hour or so before he was to be hanged. He did it to avoid bringing upon his name and his family the disgrace of having it said that he was hanged. This, whether a wise act or not, was clearly an act within reasonable discretion. Does any one suppose that the person who furnished him with the necessary instrument was a criminal? An illustration of this fact is found in England, whose government, for a thousand years and more, has been little or nothing else than a band of robbers, who have conspired to monopolize the land, and, as far as possible, all other wealth. These conspirators, calling themselves kings, nobles, and freeholders, have, by force and fraud, taken to themselves all civil and military power; they keep themselves in power solely by force and fraud, and the corrupt use of their wealth; and they employ their power solely in robbing and enslaving the great body of their own people, and in plundering and enslaving other peoples. And the world has been, and now is, full of examples substantially similar. And the governments of our own country do not differ so widely from others in this respect as some of us imagine. It is to this incentive alone that we are indebted for all the wealth that has ever been created by human labor, and accumulated for the benefit of mankind. Except those great crimes, which the few, calling themselves governments, practice upon the many, by means of organized, systematic extortion and tyranny. And it is only the poverty, ignorance, and consequent weakness of the many, that enable the combined and organized few to acquire and maintain such arbitrary power over them. That is, from September 1, 1873, to March 1, 1875.